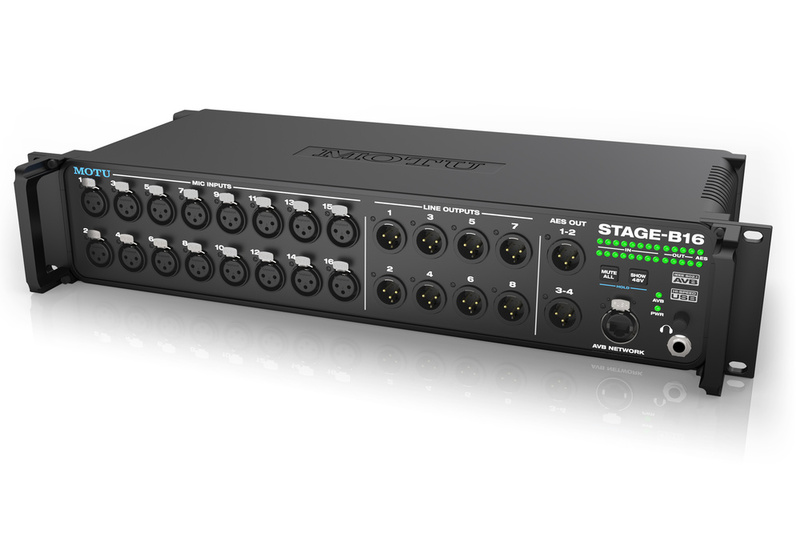 MOTU is now shipping the Stage-B16 ($1,695), a stage box, rack-mount mixer and audio interface with analogue performance up to 192 kHz, DSP for mixing and effects processing, and connectivity to a digital snake, audio network or host computer through AVB Ethernet or class-compliant high-speed USB 2.0. 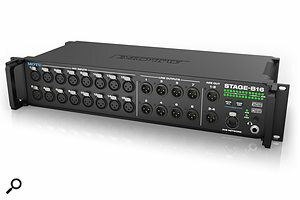 The Stage-B16 can operate as a stage box, stand-alone mixer or audio interface, and control is afforded with a web app that will run on iOS, and various other tablets, smartphones and computers. The onboard DSP delivers large console style mixing with 48 channels, 12 stereo busses, and 32-bit floating point effects processing, including modelled analogue EQ, vintage compression and classic reverb. A sturdy, two-rackspace aluminium alloy chassis with optional handles provides the following front-panel connectors: sixteen studio-grade mic inputs with individual preamps and 48V phantom power, eight line-level analog outs on XLRs, four channels of AES/EBU digital output on two XLRs, a quarter-inch phone jack with volume knob and an EtherCon AVB Network connector. A bank of 26 LEDs provide signal activity and 48V phantom power status for all channels. The rear panel provides USB 2.0 for connection to a host computer (compatible with USB 3.0 and iOS), MIDI IN and OUT connectors and an auto-switching international IEC power receptacle.